The International Resident Leadership Summit is a landmark event, bringing together residents from around the world for a practical and resident-focused summit to support present and future resident leaders. 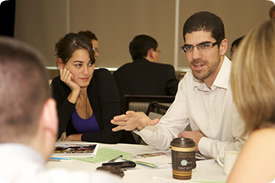 Held from September 28-29, 2013 in Calgary, Alberta, IRLS’s dynamic learning environment combines world-class lecturers and workshops, while addressing some of the biggest challenges facing residents today. From an opening plenary with Dr. Christian Kraeker on global health, to a session on managing the personal and professional challenges of life after residency, as a resident, you can’t afford to miss this year’s Summit! For all the details, including the online program, visit the IRLS website or contact irls@royalcollege.ca.